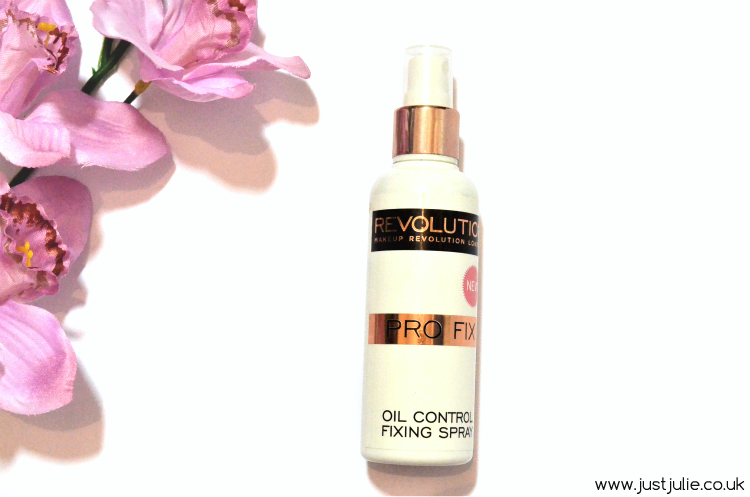 Makeup Revolution have recently launched their new Pro Fix Oil Control Makeup Fixing Spray* and as someone who suffers with oily skin, I jumped at the chance to try it out. As someone who works underneath bright lights all day long and generally wears her makeup for up to 12 hours it's important that I wear makeup that will stay put as I don't want to be caking my face up even more during the day. To be honest most days it does stay put quite well, but you know what it's like if you have oily skin, some days you end up looking like an oil slick, which is never pretty! I've dabbled in a few setting sprays, and yeah they were ok but I can honestly say I've never noticed a huge difference and quite often my skin has been left feeling tight, so I was curious to see if Makeup Revolutions new setting spray would do the same as the others. The Pro Fix Oil Control Makeup Fixing Spray is designed to help keep oil breakout at bay, leave you with a matte finish that is meant to last for up to 12 hours. Firstly the spray is extremely light weight, when sprayed at arms length, which will just lightly mist the product on to your face. It does feel slightly wet when you first apply it, but after about 20 seconds it dries almost instantly and you're good to go. I've been using this for two weeks now and I'm really impressed with how this helps reduce my oiliness, especially on my nose, which is my oiliest area. Although this does help to keep my makeup matte, I also feel like it's helping to hydrate my skin. I'm not sure it is hydrating though, I think it just feels like it is as it doesn't leave that tight feeling that the other setting sprays have done before, so for me that's a plus! My makeup hasn't slid off during the day and I'll be honest, I could quite easily go out after work for the rest of the night and my makeup is still looking pretty darn good! Yet again this is another product that has impressed me from Makeup Revolution and at the price of just £5 it's definitely worth investing in if you suffer with oily skin and struggle to keep your makeup in place. Don't be worried and feel left out those who don't suffer with oily skin, as they already sell a setting spray for you guys just HERE and that's only £5 too! Do you use a setting spray? Do you notice a difference?